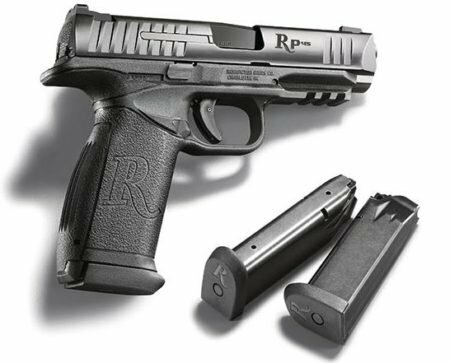 The new Remington RP9 striker-fired pistol is uniquely familiar. Remington Arms has gone the way of Glock. Introducing their new polymer framed, striker-fired RP9 and RP45 two months ago at NASGW Show, the company continues to make moves into the pistol market despite the catastrophic recall of the R51 last year. The two new pistols combine features of the Glock, Walther, and S&W striker-fired pistols, but have some unique features as well. The new Remington RP9 is chambered in the very popular 9×19 mm, while the RP45 will be chambered in .45 ACP.45 ACP. 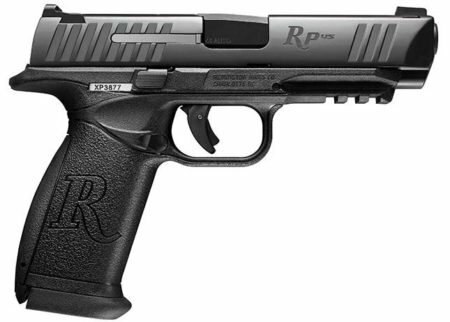 The two pistols come very late to a very saturated market for polymer, striker-fired pistols. Another hurdle for Remington to overcome will be the horrendous press on their failed R51 project that had so many firearms enthusiasts really excited before the collapse. 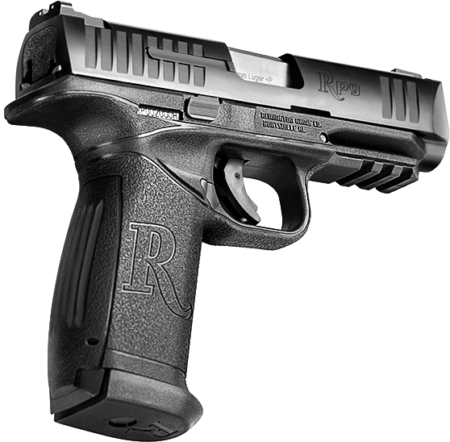 The RP9 has features similar to Glock, Walther PPQ and S&W M&P. The RP9 takes on a uniquely familiar profile. Though there are definitely unique features, there are clear influences from Glock, Walther PPQ, and Smith & Wesson M&P pistols. 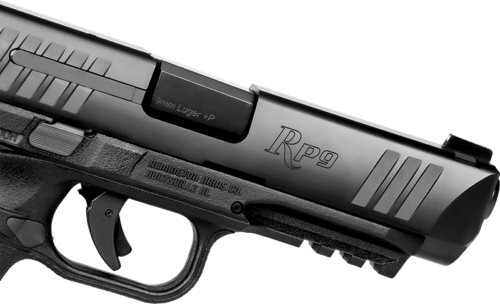 Like its predecessors the RP9 has a polymer frame, and a striker-fired action. The internal chassis is serialized, a requirement of the Army’s new Modular Pistol program, which likely shows Remington’s desire to compete. 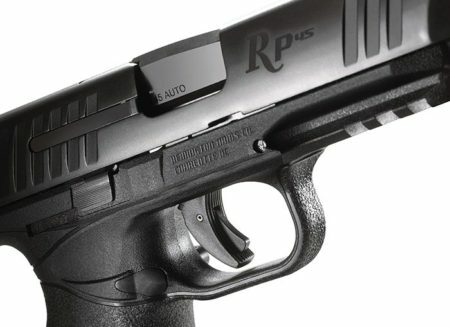 The RP9 has a steel slide with front and rear serrations, and etched labeling. The steel slide has grip serrations on the front and rear like the Walther PPQ, and is a feature that more shooters are starting to really appreciate. The rear sight is specifically designed with a “fighting surface” to facilitate one-handed slide racks. The ejector has a dual function loaded chamber indicator that sticks out from the frame for tactile confirmation of a loaded chamber. The slide and barrel have been PVD treated to enhance durability and longevity from exposure to the elements. The RP9 frame is polymer, and comes with a very subtly textured grip that is absent any finger grooves. Finger grooves work great for some shooters, but are miserable for others whose hands just don’t fit the grip quite right. The texture definitely takes on first generation S&W M&P or early Glock models, and is kind of surprising considering both competitors have since increased texture for greater grip control. This frame has been pre-designed to accommodate both 9mm and future .40 S&W caliber pistols. There is a 3-slot Picatinny rail on the front of the frame for lights or lasers. Front and rear slide serrations, and high grooved grip are nice features. The grip has ambidextrous grooves at the top of the grip, designed to bring the strong hand higher on the grip, and the trigger finger closer to the frame, for what Remington calls increased shootability. Remington claims the RP9 and RP45 grip will fit 95% of shooters, but it is unclear how they came to such a conclusion. Though this is a hefty claim, the RP9 does come with (3) interchangeable back straps (small, medium, large) that will further customize the grip to the shooter. The trigger has a trigger bar safety that looks almost identical to the Glock trigger. The slide lock lever takes on a S&W M&P appearance, and is ambidextrous for easy access for right or left-handed shooters. The RP9 feeds with double-stack steel magazines designed with the industry’s highest capacity per caliber. 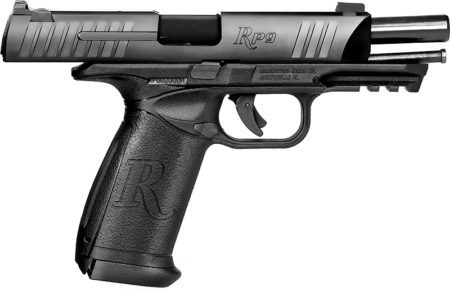 The RP9 has an 18+1 capacity, which is just outstanding for a duty pistol. Double-stack 18-round steel magazines feed the RP9. PVD finish on slide and barrel for maximum durability. The Remington RP45 has an outstanding 15+1 capacity (photo courtesy of GunsHolsters & Gear). 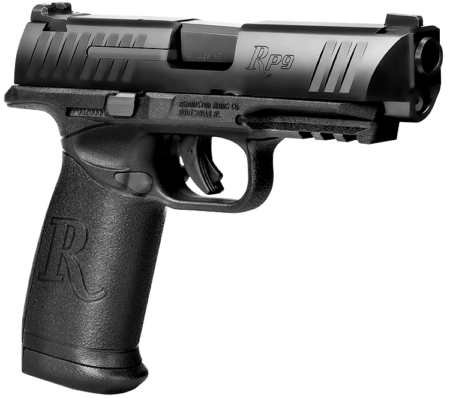 The Remington RP45 has all of the same features as the RP9, with just a caliber change to .45 ACP. The new RP45 has an outstanding 15+1 capacity, fed by steel double-stack magazines. 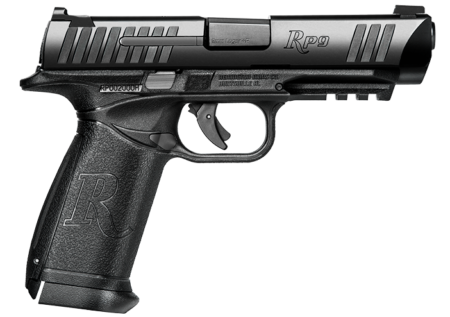 Amazingly, according to the NRA American Rifleman magazine, the RP45 has all of the same specifications as the RP9. This includes overall weight, height, width, and length. So far the RP45 looks good (photo courtesy of GunsHolsters Gear). We’ll definitely be looking up Remington to get our hands on the RP9 and RP45 at SHOT Show in 2 weeks. Once we’ve taken a closer look we’ll post another update with any more specifics or opinions we develop from our personal experiences. Hopefully, Remington will have the RP9 and RP45 on the range for Industry Day at the Range. Until then, it appears Remington may have actually found a pistol that can compete. Though the striker-fired market is full of options now, there are plenty of fans of Big Green. The R51 was disastrous for Remington, but their R1911 has actually gained a lot of praise. Time will tell if the RP9 and RP45 will be another winner or another dud for America’s oldest firearm company. If the RP series turns out to be winners, I would not be surprised to see law enforcement agencies select them as their duty pistol. With some of the best features from the most popular striker-fired, polymer pistols on the market today, the RP pistols also have a very competitive price as well. The Remington RP45 appears to combine the best features of competitors (photo courtesy of GunsHolsters Gear). So, you didn’t shoot them. Sam unfortunately Remington did not have the RP9 and RP45 out at the Industry Day at the Range (SHOW Show range day) in 2017 when this article was published. This was a very surprising omission on Big Green’s part, especially considering their significant media push leading up to SHOT SHOW. Many media outlets spoke very negatively about Remington’s “hype” and no delivery. Though Remington suffered terribly with their R51 debut, they still should have had the pistols available – or don’t release them! We were unable to attend the 2018 show, but it seems that several reputable YouTube reviewers are saying the RP9 and RP45 are decent pistols. Sam we planned on shooting them at the 2017 Industry Day at the Range (SHOT Show range day prior to the show starting). However, Remington did not have them out on the range, something everyone was very disappointed about. Remington suffered a major PR setback with the R51, and everyone had serious doubts about the RP9 and RP45 with Remington’s “hype” leading up to the Show and then no-show at the range. However, several reputable reviewers have test fired the pistols and advise they are decent and reliable. I’m still a little shy about their quality and dependability over time considering Remington’s no-show at the range.